Skateboarding is over of the most popular sports worldwide. And it is a sport that can be practiced at any age by all kinds of people. However, having the appropriate equipment is highly important. Not only for your safety but it is also for the quality of skateboarding. And the most important part of your skateboarding equipment is the type of shoes that you wear. Choosing best skateboarding shoes for your needs might be tricky especially if you are a beginner. But here are some tips that will help you make the best decision! Why Is Important To Choose The Best Skate Shoes? The right pair of skateboarding shoes will help you stay safe and perform better. They will not only protect your feet while skateboarding but also increase your stability on the board. When it comes to your longboard shoes, they will be your best friends while practicing your favorite sport. If your shoes are not comfortable, you might even risk your life during skateboarding. A wrong pair of shoes can increase your lack of stability and put you in danger. It is the main reason why having the best skate shoes should be your priority when you pick your equipment. When you are shopping for the best skateboard shoes, fashion is not the only aspect to consider. There are many others to look after if you want a pair of functional shoes! The sole that the shoes have is crucial for your comfort. You need to consider the shape of your foot when you choose the right sole for it. It will not only make your skateboarding more pleasant but also increase your safety. If your shoes don’t have the right sole for your feet shape, you will not be stable while skating. The material of your shoes is highly related to the weather that you are planning to skateboard on. If you live in a tropical area, you want your feet to breathe and feel the breeze. So, you will need a light material that allows air to go through it. For rainy or winter weather, you can choose more resistant shoes made of leather. When you buy a pair of skateboarding shoes, your choice will be strongly based on your budget. There are shows for everyone to afford out there. Also, if you aim to make a long-term investment, is important to get a quality pair even if it will not be the cheapest. Make sure you pick the best skate shoes for your budget. Before you are buying the skateboard shoes, think if you are going to use them just for a skateboard. Some people prefer a pair of shoes that are adaptable to more situations and sports. It works to your advantage to establish the purpose of the shoes. It will help you pick the best pair according to your needs. Now, these shows will satisfy most of your skateboarding needs. They are finely designed for a variety of tastes. You can also wear them as casual shoes as well because they are so adaptable. The Adidas NEO Men’s shoes are made to satisfy both beginner and expert skateboarders. They will charm the eyes of everyone around you as well! If you want to feel comfortable and stay safe, they are a great choice. Not to mention that they are easy to clean and take care of so you can enjoy them even longer! Their best features are budget-friendly and come in high quality. These shoes are made of fabric and synthetic material with a rubber sole. The denim upper gives them a very modern look. And they look even more elegant with the three strips of leather placed on the sides. They are easy to purchase in all sizes and a great addition to your skateboarding equipment. The Vans Unisex Skate shoes are perfect for both men and women. They have a long lifespan so you can enjoy them for years. What is even better about these shoes is their high comfort they offer. The great aspect about these shoes is their unisex feature. They can be enjoyed by men and women equally! It makes it easier for you to trade them with your partner in case she can’t resist the urge to wear them! With these shoes, you will not only feel safe during skateboarding but also be remarked as a stylish skateboarder! They are made of light canvas and have a waffle sole which makes them very light. You will not even realize you are wearing them! The design is empowered by the canvas upper in a casual way. 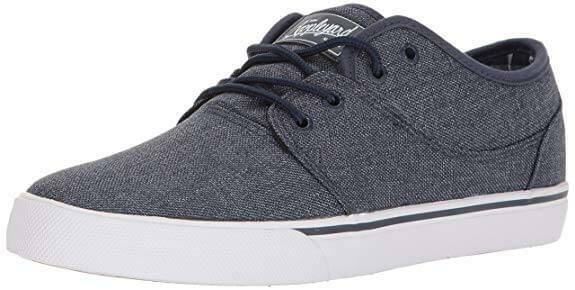 It makes them very adaptable shoes for casual activities and longboarding as well. Vans Unisex shoes are great for any budget, and they can be achieved in different colors. These are some of the best skateboard shoes on the market! The converse is a well-known brand of shoes that offers a variety of models for both beginner and expert skateboarders. You can find the perfect pair based on your personal needs and features. If you have long feet or a particular type of sole, these are the ones for you! They are meant to last for a long time and are considered some of the most quality ones on the market. They add a higher safety level to your skateboarding time and make you look modern and stylish. While you are wearing such a pair of shoes, you can’t be anything less than a winner! The shaft of these Converse shoes measures 2 inches from the arch. They come in a classic Converse style with a canvas upper and rubber sole. Perfect for wearers of any gender! A great feature of these shoes is the fact that they run a half size larger than your normal shoes. It makes them comfortable to wear and adapt to different sports. These are the types of shoes that drag attention over them in the best way possible. If you want to stand out, ​DC Men’s Pure Action Sport Sneaker is the best option for you. They are durable and resistant to a variety of activities. You can wear them during a casual day or longboarding. But the best thing about these shoes is the safety level that they provide during skateboarding. You will feel both comfortable and secure on your moves. They provide the wearer with a great and comfortable cushion system inside. It makes your feet feel spoiled and relaxes all day long! They are made of high-quality leather material and a nice rubber sole. The shaft measures low-top from the arch. These shows are made for performant wearers, and they offer a great balance during longboarding. The rubber sole is an abrasion-sticky one which increases the stability during walking, running and skating. These shoes come in so many colors that might be hard for you to settle for just one pair. They are also very durable and comfortable! And not to mention that they adapt easily for many sports and casual days as well. You can dare to have a full day of longboarding or just a walk in the park. These shoes will be perfect for both these activities! Besides their stylish design, Globe Men’s Mahalo shoes come with a great history of quality and performance. It is a trusted brand and a very accessible one for most skateboarders. You can wear them during other sports as well! When it comes to good features, the Globe Men’s Mahalo is some of the best skateboarding shoes out there. They come in a variety of sizes and are made of a resistant textile material. The removable insole makes them even more adaptable to your needs! If you want to feel safe and comfortable at the same time, these shoes are your best choice! Buying the best skateboard shoes is not an easy task, but it is definitely worth the time. If you consider all the aspects presented above, there is no way to fail in the process. Chances are you will end up with more than one pair if you are a picky buyer. The market offers shoes for all styles and tastes, but your main concern should be your safety. When you are wearing the right shoes for you, you will perform any sport with more confidence. It will give you a different experience and a high-quality time along with your friends!